The hostel was super noisy, I didn’t sleep well and we had to get up early. In the next section the official trail is across the water so we had to get a water taxi, which can only operate at high tide. High tide was at 7am this morning so we had to be up at 4:45 so we could walk the 4 miles there in time. It was still dark when we left so headtorches helped us see and be seen by the cars. The trail follows the shore but at high tide it is recommended that we walk the road. So that’s what we did, and unlike the flat coast line the road trail goes up then down a big hill. The road walk was again sketchy. No shoulder and fast moving cars. We made it to Opua at 6:30am just in time for the general store to open. I wasn’t expecting to get anything from there but the temptation was too much and I bought a spinach and ricotta roll (which I wouldn’t buy again), a chocolate milk and a really dirty flavoured Mountain Dew. The chocolate milk was the most amazing chocolate mile NZ$6.50 can buy and it has half my RDA of calories! Maybe I should get the smaller one next time. So with all that, the squiggles Hollywood gave us and the 2 croissants I ate on the way I think I’ve consumed my allowance for today. Confusingly they use kilo joules, not calories here but it’s fairly easy to work out by just dividing by 4 to get the amount in kcal, but it can be a bit taxing on the on the old grey matter. We walked up the wharf to wait for the boat with Sarah (Canadian/American), Remy (French) and Krea (Taiwanese). It was a little speed boaty thing and we crossed the inlet in about 25 minutes. It was pretty cold. We faffed about a bit at the other end, I really needed to drop off the kids but it’s very difficult to do in New Zealand with all the private land, so they stayed inside. We walked up a dirt road us three in front and the other three slightly behind. We saw a bull just roaming around on the road (bulls are so ugly compared to lady cows) and we saw it just walk over the fence to get back into the field. He kept one eye on us and one eye on his grass as we passed. We occupied ourselves by making up songs we can sing to the cows when we pass them. That’s the great thing about hiking with people, you don’t have to plug yourself into your earphones. We then started our second river walk, the water was a bit colder this time but it was still fun. Sarah caught up to us and we all walked the stream together singing songs to pass the time. It got fairly deep in parts, just coming over the bottom of my shorts. I prefer all water crossings to be sub-growler. About a mile after the river is a shelter where we sat and ate and dried out our shoes a bit, Remy and Krea caught up to us and we stayed there for a lot longer than we meant to, mostly trying to work out a plan for the next couple of days. Our shoes had dried out a bit and we eventually summoned the effort required to pack up and carry on. The dirt road climbed up and then went down again, one of those updowns, then we joined a highway for a while. Sarah was walking with us so it was nice to have some fresh conversations and get to know her a bit better. Camping around here is very difficult, there are so many restrictions and so much private land, so we saw from a facebook post that there was a camp site just off the trail. We got to the turning and walked more road down to the bay. It was further than we thought but a little shop brightened our spirits and we were able to but cold drinks and use a flush toilet which was nice. Julia and I bought a. 1.5 litre bottle of sprite to share because it was much more economical than a can. We noticed there was a little takeaway down the road and planned to get fish and chips but when we arrived it was closed, only open Thursday- Sunday. This, combined with the extra road walk and finding out that the camp site was still another mile away tested my mood to the max. Our only option was to continue on down the road to the campground. Sarah had a picture of a post from Facebook recommending somewhere to stay which we thought was the campground, but on our way there we saw the place with an old caravan outside and a very angry dog. The dog was chained up but it was barking incessantly as we approached the house. The owners weren’t home but a notice on their door told us to give them a call. 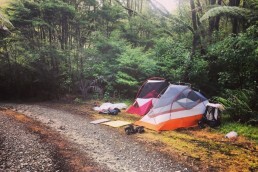 Sarah called them and we were able to pitch our tents for NZ$10 per person. I don’t mind paying for camping but I do expect some amenities for paying. At least access to a toilet and water, wifi would be a nice bonus. But as they weren’t home we didn’t get anything. We pitched our tents and then dicked around on the beach for a while. When it came to going to bed I could barely keep my eyes open and fell asleep without writing anything. I’m not going to moan about road walking. It’s part of the trail and people should know that before they attempt it. But man it’s tough on your body. My legs are throbbing and I feel completely exhausted. Not good for my hips, knees or sanity!